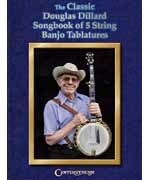 Published by popular demand, this long-awaited songbook contains exact transcriptions in banjo tablature that capture the unique playing style of Douglas Dillard. This fantastic collection includes all of his best-loved tunes, from the Andy Griffith Show, from his many great years of recording as the original Dillards, and from his solo banjo albums and his releases with The Doug Dillard Band. Features more than 20 tunes in G tuning, C tuning amd G modal tuning, including classics such as: Cripple Creek � Hickory Hollow � Jamboree � John Henry � Old Joe Clark � Buckin' Mule � and more. A must-have for all banjo players! Strengthen your skills while building a repertoire of great bluegrass banjo pieces! Tony Trischka has personally chosen twenty traditional banjo solos that will teach you new ideas and add to your arsenal of licks and techniques. On the CD, Tony performs each tune slowly, then up to speed.